No. Each family of processor chip (MIPS, PIC, SPARC, Alpha, Motorola, Intel, et al.) has its own architecture. The architecture of a processor chip is a description of its basic components and of its basic operations. Each processor family has its own architecture. 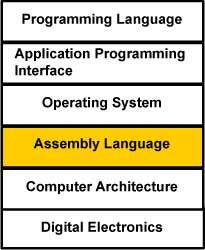 Assembly language is a programming view of the architecture of a particular processor. Each type of processor has its own assembly language. When you study an assembly language, you study the architecture of a particular processor. The study of any assembly language increases your professional understanding of computers. These notes are about the MIPS processor, which is a nice processor to study. The concepts in MIPS assembly are universal. These notes discuss assembly language from a computer science perspective. They explain what is going on in a computer system at the assembly language level. This is a view that is above the electronic view of computer architecture, but is below the operating systems view of the computer system. Computer scientists understand computers at many levels. They understand how the many levels are built one on top of another. Each of these levels corresponds to one or more courses in a computer science degree program. (Rhetorical) Does your understanding of computers depend on which assembly language you study?